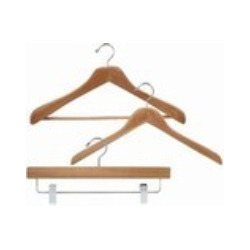 With our in-depth knowledge and experience, we are engaged in offering a finest quality Hangers & Cloth Pegs. The offered products are made by our experts using best grade material and modish technology. Additionally, offered products are made available in several specifications. Furthermore, these products are highly demanded by our customers for their excellent features. We, Khushi Enterprises, established in the year 1996, are among the prominent manufacturers, suppliers, distributors and wholesalers of a wide range of the premium quality of Plastic Granules, Hangers & Bags. The product range offered by us is inclusive of Plastic Granules, Garment Hangers and Non Woven Bags. Their excellent thermal stability, optimum strength, high density, impeccable finish and distinctive appearance, make these plastic granules highly demanded in the market. By using advanced machinery and equipment, we have been able to manufacture the offered range of plastic granules, hangers and non-woven bags in compliance with the industry set norms and regulations. With the aid of our large production line, equipped warehousing unit, wide distribution network and efficient workforce, we have been able to cater to the precise needs of our valuable customers in the most efficient manner. Some of our valuable customers that are associated with us over a long period of time are Garware Wallropes, Raymonds and Future Group.